The 11.5-mile Metro Gold Line Foothill Extension is now 50 percent complete, according to the Gold Line Foothill Extension Construction Authority, which is building the Pasadena-to-Azusa/Glendora border project. Below are an awesome collection of aerial photos taken in recent days by the Construction Authority. The news release — with a lot of good info — follows the photographs. 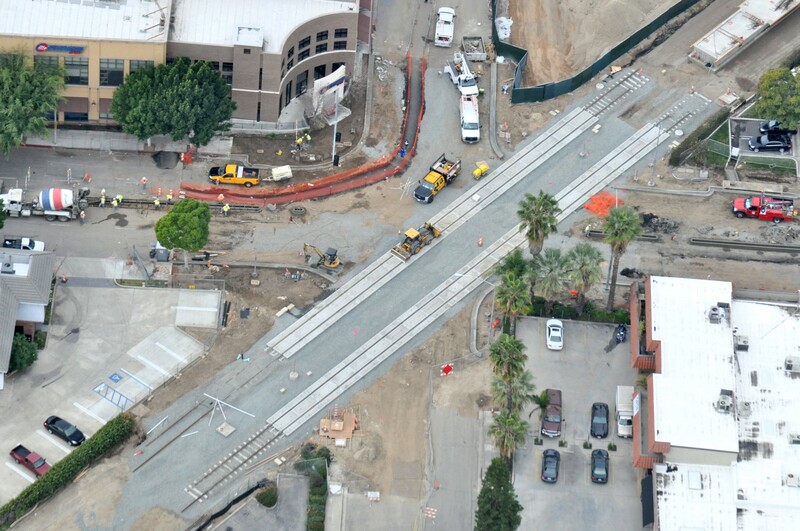 Above is the work being done to extend the Gold Line’s tracks beyond the current terminus at Sierra Madre Villa in Pasadena. 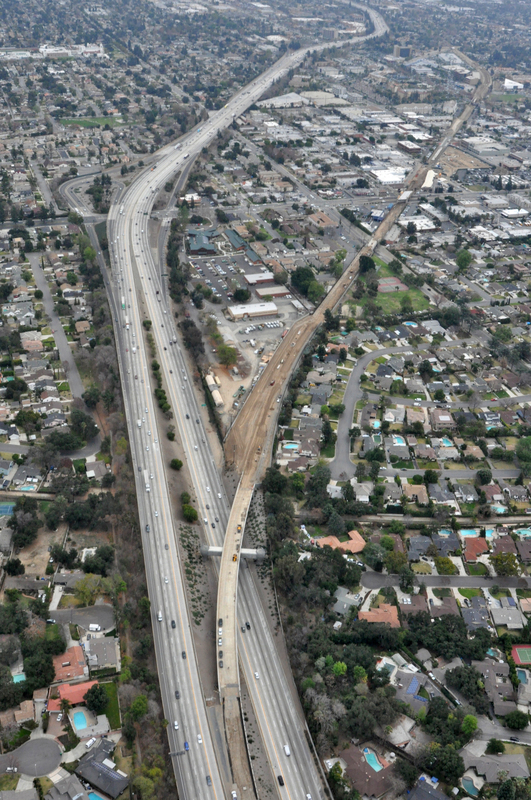 A view looking east and south of the Gold Line’s right-of-way leaving the median of the 210 freeway and headed toward downtown Arcadia via the new Basket Bridge over the 210’s eastbound lanes. 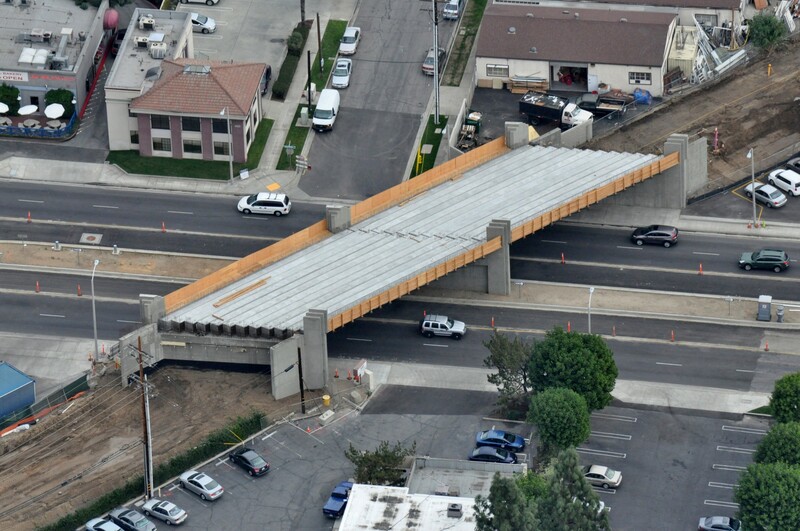 The new bridge carrying the Gold Line tracks over busy Santa Anita Avenue. The old tracks were at street level. 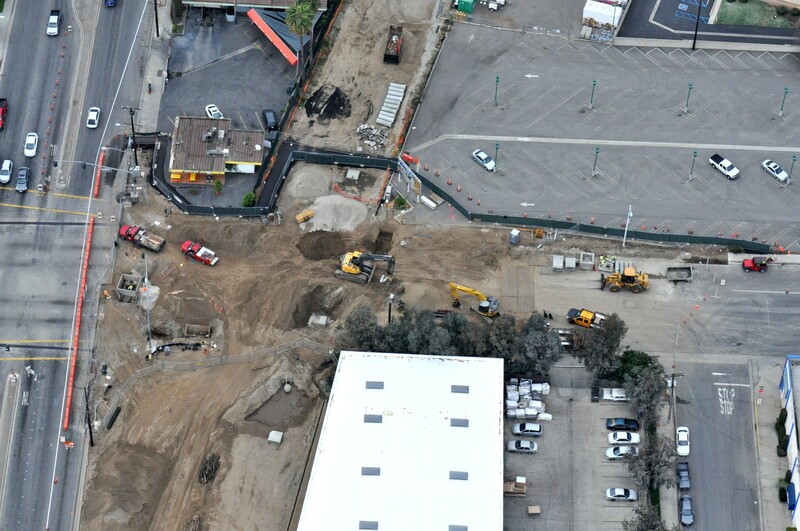 The Arcadia station and parking lot taking shape. The station is right behind the popular REI store with the rest of downtown Arcadia a short walk south on First Street, which runs along the bottom of this photo. A closer view of the tracks crossing First Street in downtown Arcadia. The platforms for the Monrovia station and nearby parking. 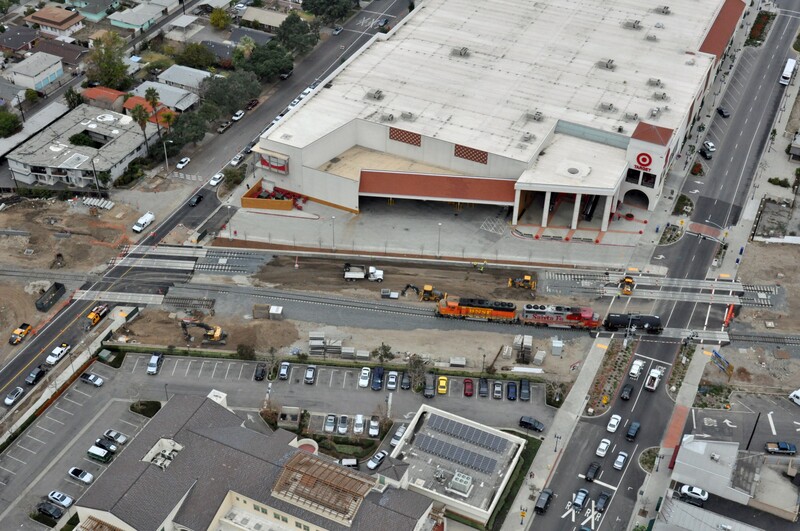 The old Santa Fe depot is at bottom left — the platforms for the Gold Line sit to the west. 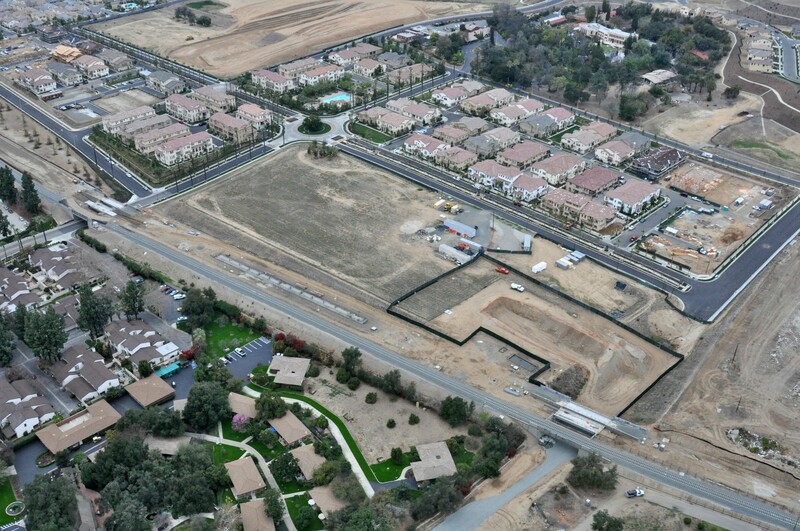 That’s the intersection of Duarte Road and Myrtle Avenue at bottom left. The Myrtle Avenue crossing in Monrovia. 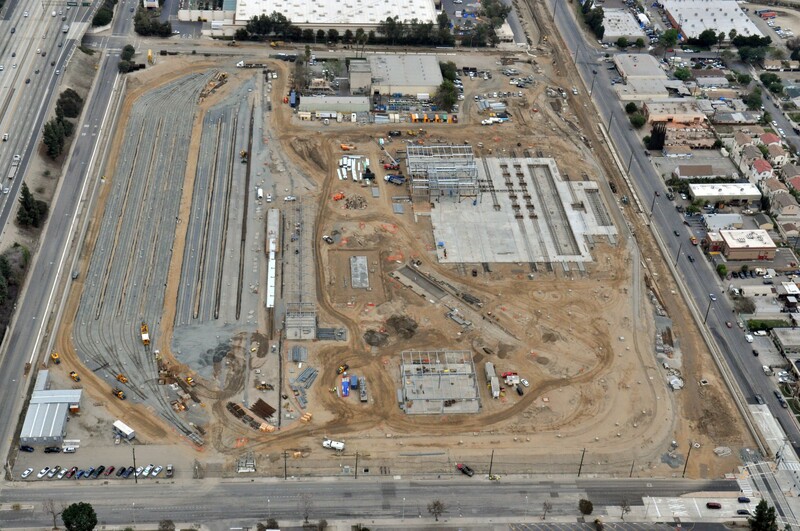 The new rail car maintenance campus in Monrovia that is between the 210 freeway, at left, and Duarte Road. A ground level view of what will be the main building at the maintenance campus in Monrovia. The Duarte station at Duarte Road and Highland Avenue. City of Hope is just south of the tracks. The tracks east of Highland Avenue in Duarte headed toward the 605 freeway and Irwindale. The new rail bridge over the San Gabriel River in Irwindale. The location of the future Irwindale station — south of the 210 and east of Irwindale Avenue. 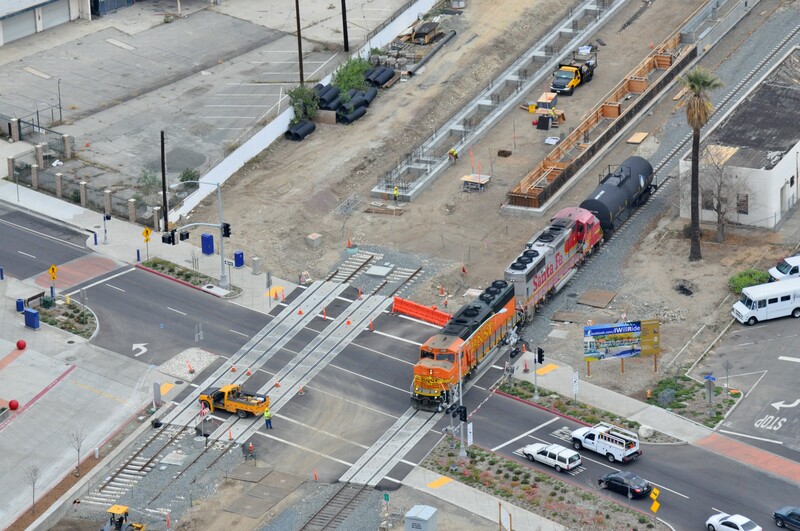 BNSF train crossing Azusa Avenue on relocated freight track in Azusa. 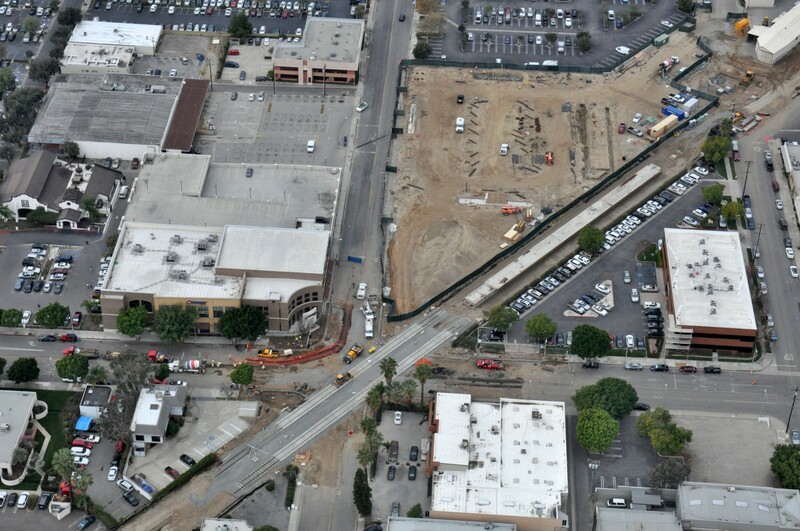 Another view of the old right-of-way — which the Gold Line will use — and the new freight track. 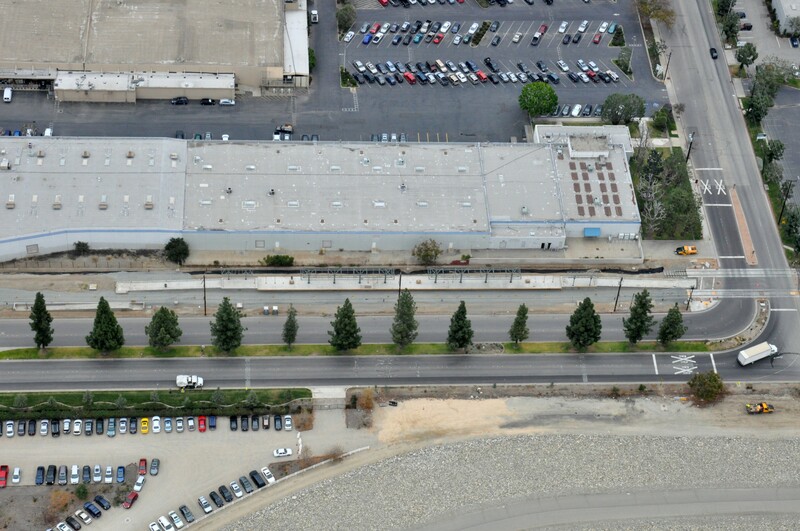 The Gold Line tracks looking east from the bridge over Foothill Boulevard in Azusa. The Gold Line platforms in downtown Azusa next to the old Santa Fe depot along with the newly realigned freight track. 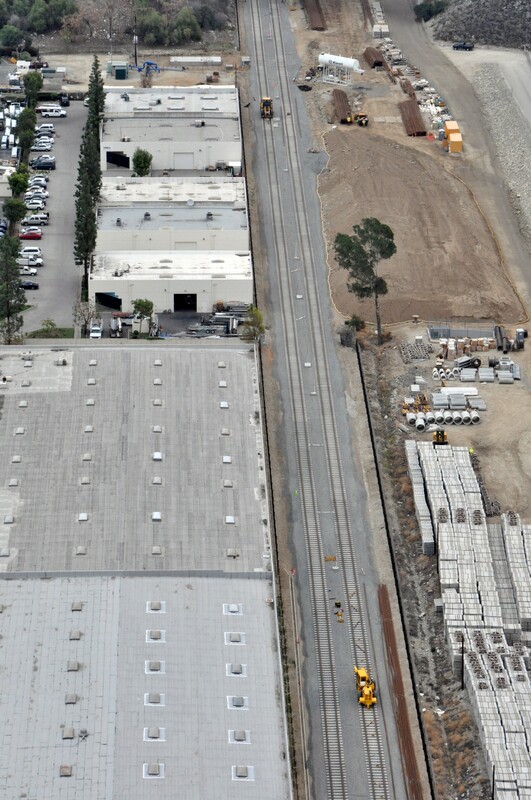 The newly realigned freight track in Azusa adjacent to the platform foundations for the station that will serve Citrus College and Azusa Pacific University, which are out of view at the bottom of the photo. MONROVIA, CA – The Metro Gold Line Foothill Extension Construction Authority (Construction Authority) announced today that the 11.5-mile Metro Gold Line Foothill Extension light rail project from Pasadena to Azusa is now more than halfway to project completion. 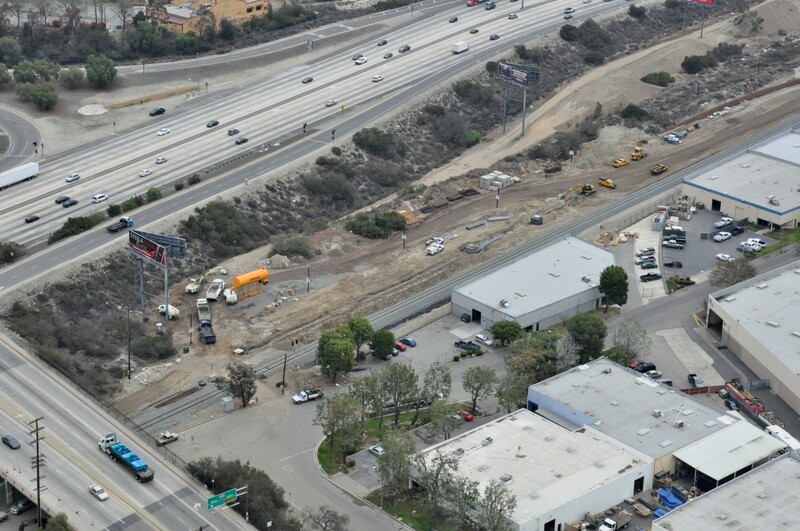 When completed, the nearly $1 billion Measure R project will include six new light rail stations with intermodal parking facilities in the cities of Arcadia, Monrovia, Duarte, Irwindale and Azusa; two dozen new and rebuilt bridge structures; 14 at-grade street crossings; 3.6-miles of relocated freight track within a shared corridor with BNSF Railway; and a 24-acre, $265 million Operations Campus to house up to 84 light rail vehicles. All three design-build projects have been awarded for the project: (1) the $18.6 million Gold Line Bridge to Skanska USA; (2) the $486 million Pasadena to Azusa Alignment to Foothill Transit Constructors – a Kiewit-Parsons Joint Ventura (FTC); and (3) the $48.7 million Intermodal Parking and Enhancements to Webcor. The Gold Line Bridge was completed on time and on budget in late 2012, and was recognized in 2013 with five prestigious industry awards for its design and construction. 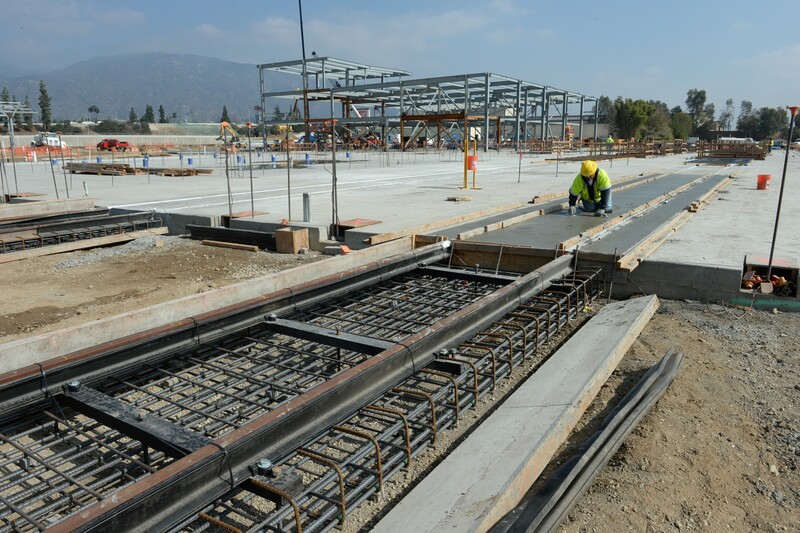 The largest contract – the $486 million Pasadena to Azusa Alignment – is being designed and built by FTC, and is also on-schedule and on-budget. Since work began in early 2012, FTC has utilized nearly 500,000 work hours on the project and has now surpassed 50% completion. To date, eight at-grade street crossings, 15 bridge structures, 40% of the Operations Campus, and 70% of the utility work has been completed. 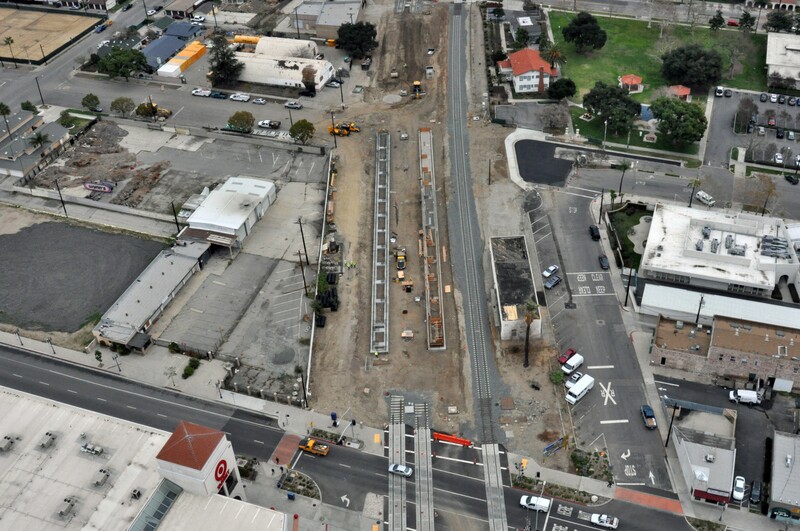 The freight track between San Gabriel Ave in Azusa and the Glendora city border has been fully realigned to its new position south of the future light rail tracks, more than half of the Overhead Catenary System foundations have been put in place, and light rail track is starting to be installed. Importantly, of the nearly half million work hours completed, none have been lost due to injury. Just 18 months from now, the Alignment and Parking contracts will be completed. 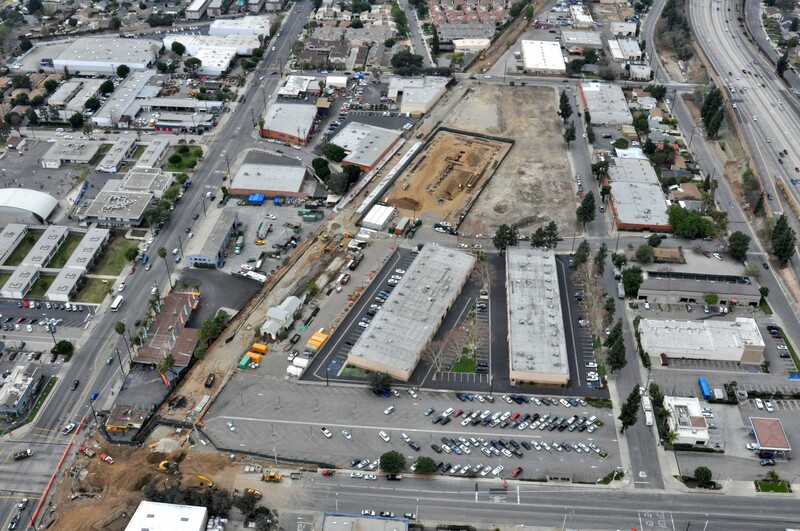 The Construction Authority anticipates having the Operations Campus ready for the Los Angeles County Metropolitan Transportation Authority (Metro) in March 2015, and the remainder of the project turned over to Metro in September 2015 for testing and pre-revenue service. Metro will decide when the project opens for passenger service. About the Metro Gold Line Foothill Extension – The Foothill Extension is a nearly $2 billion, 24-mile extension of the Metro Gold Line light rail system, being overseen by the Metro Gold Line Foothill Extension Construction Authority, an independent transportation planning and construction agency. 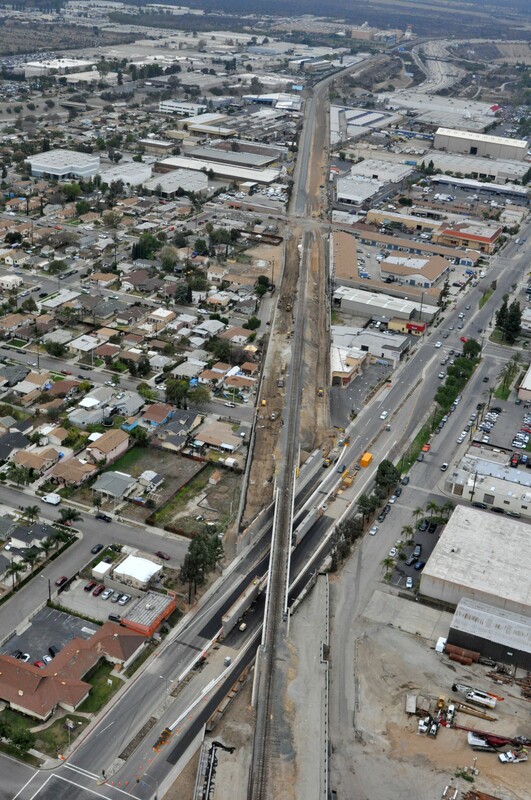 The project is planned in two segments – Pasadena to Azusa and Azusa to Montclair. The Pasadena to Azusa segment is fully funded by Los Angeles County’s Measure R and is on schedule to be completed in September 2015, when it will be turned over to Metro for testing and pre-revenue service. Measure R is funding the majority of the cost associated with the upcoming advanced conceptual engineering and environmental work for the Azusa to Montclair segment (San Bernardino County will fund their portion of the work). The Construction Authority issued a Request for Proposals for this work in January 2014, and anticipates awarding a contract for the 18-month design and environmental work in April. The Construction Authority continues to work with Metro to seek the nearly $1 billion needed to construct the Azusa to Montclair segment. This is going to make the Arcadia REI the most transit-friendly REI store in SoCal (with runner-up props given to the Douglas Station-adjacent REI in Manhattan Beach). Very tasty photos indeed! Fantastic! 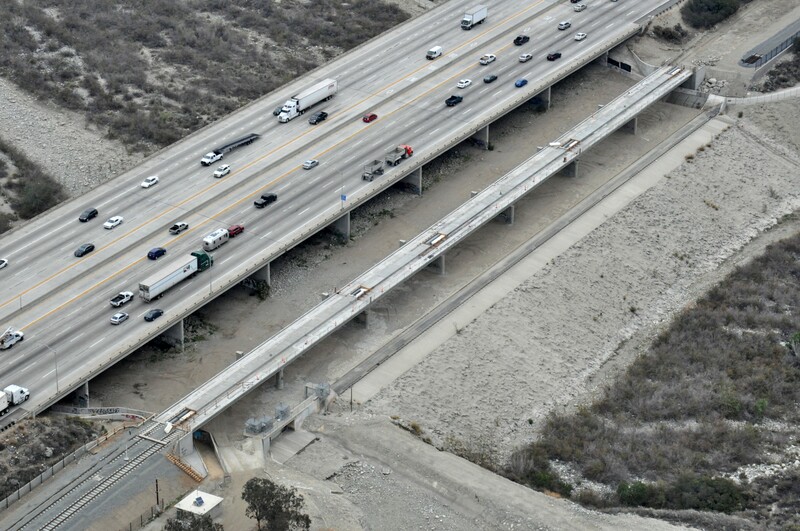 Is any work being done (or needed) to the bridge over the 210 Freeway in Irwindale? Is it wide enough for three tracks (2 LRT and the 1 freight track). It appears to be in great shape, so was curious if anything is needed. Yeah, the Arcadia station is basically next to REI. Bring your bike on board, go to REI to pick up some small items, and bike. Lots of biking trails and paths near the Foothill Extension stations: Duarte (SG River bike path), Irwindale (SG River and Santa Fe Dam), and Azusa-Downtown (SG Canyon Road). Metro really needs to think out of the box when the reginal connector is built. Gold line trains not only running to long beach but to santa monica would be a huge advantage. Please metro dont drop the ball, let this line run its full potential. To clarify, the “top” of the photo is west (the brown blob at very the top is the SG River and Santa Fe Dam) and the “bottom” of the photo is east (Azusa-Downtown Station). So it’s looking west from Azusa. These stations are being built with gates in mind so that we don’t repeat the mistakes of the past, right? I think initially the Regional Connector will only provide east/west and north/south single-seat rides, but the possibility is surely there for trains to branch out to the west and south from Pico Station, creating one less reason to transfer. I suppose the ridership modeling numbers will be key in Metro’s decision on whether to do that, though. What “Warner” said. Pasadena -> Santa Monica through the DTRC, at least half of the trains. Warner, if I understand the Regional Connector plans correctly, the Gold Line (Pasadena/Foothill Extension) will connect with the Blue Line at Little Tokyo, while the Gold Line Eastside Extension will connect with the Expo Line. Under this plan, passengers can transfer at Little Tokyo Station to go to Santa Monica on the Expo Line. In terms of simplicity, I think this is an acceptable solution. The connector is a redundant line due to it is operating from Union Station to Seventh and Flower the same as the Red Line. The actual reason is to physically connect the Blue Line and Expo Lines with the Gold Line and to alleviate the rail grid lock created at Seventh and Flower when the Expo Line was opened. 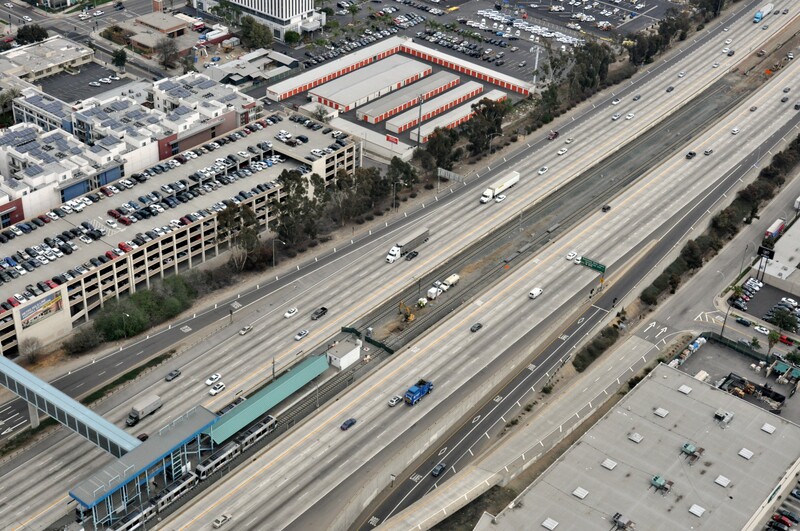 There is nothing precluding operating Azusa – Santa Monica or Long Beach – East LA from the Regional Connector. I could see that happening for special events or on the weekend, for instance – special trains might be parked at Sierra Madre Villa for the Rose Parade or Rose Bowl events that have a final destination of Santa Monica, not Long Beach. Poor planing has resulted in the need for the Connector. But yes, all the light rail lines should be inter connected so as to provide extra trains for events like New Years in Pasadena. It also results in new lines being created using alternate routes using existing tracks with the addition of switches. Santa Monica needs the direct, one-seat connection from Union Station much more than LB or East LA. It would make more sense to have the routes through the regional connector switched (Santa Monica to Pasadena, Long Beach to East LA). People come from all over Southern California (and everywhere) to flock to Santa Monica. Out-of-towners, who already went through the trouble of taking the metrolink/Amtrak to Union Station and aren’t familiar with the metro system, shouldn’t have to go through even more trouble of having to know where to transfer (even if it’s only in Little Tokyo). If the routes cannot be switched, then an easy access pedestrian path or bridge from Union Station to Little Tokyo would help tremendously. I am going to assume that your view is not supported by those in LB and East L.A.
No need for a pedestrian path or bridge to Little Tokyo, the Gold Line already goes there straight from Union Station. When the Regional Connector is completed will there still be the Gold Line that goes from Azusa to East LA? I always thought the better line would be Santa Monica to Pasadena over Pasadena to Long Beach. I think tourist would enjoy the shorter ride between Pasadena and Santa Monica than riding so far south to Long Beach through South East LA.